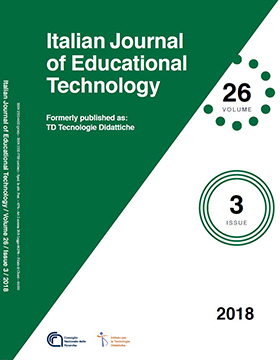 All contents of the Italian Journal of Educational Technology (IJET) are licensed under a Creative Commons Attribution-NonCommercial 4.0 International License. Readers have free online access to the contents of all issues of the journal. A print edition of IJET is also available for purchase, either on a subscription or single issue basis. Please go to "Subscriptions" to read more. TD Tecnologie Didattiche (now Italian Journal of Educational Technology) has been recognised as Classe A journal in assessment carried out by ANVUR, the agency designated by Italy's Ministry of Education and Research for evaluating research institutions and scientific output. Keep reading in About. Manuscripts undergo a double-blind peer review process involving at least two reviewers and the editor of each issue. In 2016 the rejection rate was 36%.